Convenient 2 in 1 filter/pressure regulator unit is great for small spaces or compact valve boxes. 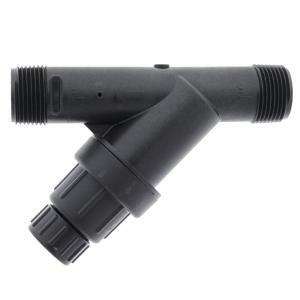 This durable plastic unit comes with 200 mesh filter screen and is available in several pressure regulating options for use in drip or lawn irrigation systems. Male pipe thread inlet and outlet compatible with most female NPT valves of same size. Filter body comes apart for easy cleaning without removing the unit from system. Always install pressure regulator/filter downstream from all shut-off valves. Be sure to install pressure regulator/filter in the proper direction. The arrow on the housing shows the direction of the flow and should always point downstream toward emitters.